Pruitt's daughter also used a room in the condo, ABC News has learned. Environmental Protection Agency Administrator Scott Pruitt’s adult daughter used a second room in the Capitol Hill condo co-owned by the wife of a top lobbyist for energy firms, ABC News has learned, despite statements from the EPA that Pruitt paid for only one bedroom. McKenna Pruitt, who served as a White House intern, stayed in the two-bedroom condo during her internship, according to two sources familiar with the living arrangements. She served as a clerk in the White House Counsel’s office between May and August of 2017, according to her Linked In page. One source added that the two had use of the rest of the condo unit, including the kitchen and living space on a lower level. The upstairs bedrooms had no other paid occupants, according to a third person familiar with the living arrangements. When attempting to reach McKenna Pruitt, a woman who identified herself as her mother said McKenna lived in Oklahoma last year. When asked where she lived during her White House internship, the woman said only, “She has nothing to do with my husband’s administration,” and hung up. Pruitt’s family footprint in the condo appears to come in contrast to a statement late Thursday from the EPA. Spokesman Jahan Wilcox told reporters Pruitt paid $50-a-night to lease a single bedroom in the three-story brick building. “While transitioning to Washington, Administrator Pruitt signed a lease to rent a bedroom in a condo and he moved out at the end of July,” he said. “As EPA career ethics officials stated in a memo, Administrator Pruitt’s housing arrangement for both himself and family was not a gift and the lease was consistent with federal ethics regulations,” Wilcox added in a second statement late Friday. 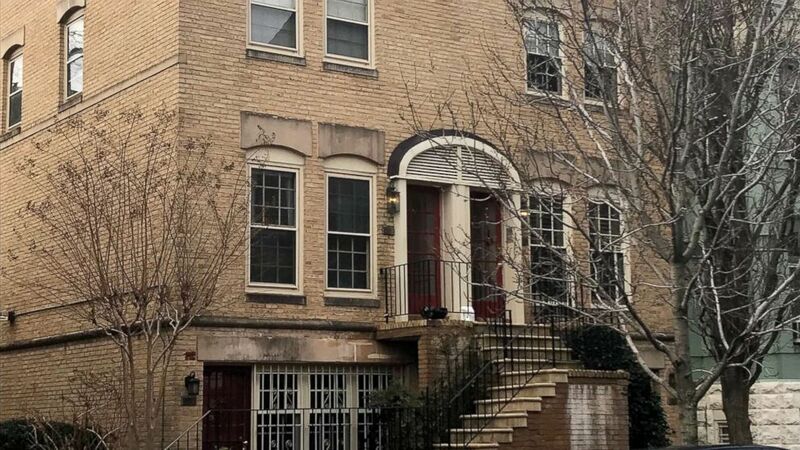 (ABC News) A three-story brick duplex one block from the U.S. Capitol where EPA Administrator, Scott Pruitt is said to have stayed. The building is co-owned by the wife of a top energy lobbyist, property records from 2017 show. ABC News first reported Thursday that Pruitt had lived in the condo in 2017, during his first six months in Washington. The condo is in a prime location -- less than a block from the U.S. Capitol complex – and other apartments in the duplex have rented for as much as $5,000-a-month, according to a source familiar with a neighboring lease. The EPA allowed Bloomberg News to review copies of canceled checks that Pruitt paid to the condo owner. The news outlet reported that the checks show varying amounts paid on sporadic dates -- not a traditional monthly "rent payment" of the same amount each month. In all, Pruitt paid $6,100 over six months to the limited liability corporation for the Capitol Hill condo co-owned by Vicki Hart, whose husband J. Steven Hart is chairman of a top D.C. lobbying firm and who is registered to lobby for several major environmental and energy concerns. A spokesman for Steven Hart said Saturday that he has not lobbied the EPA or the Department of Energy during the Trump administration. While Bloomberg reported Pruitt's lease did not allow him access to common areas in the unit, a source familiar with the arrangement told ABC News that Pruitt's daughter would often make her father breakfast, encouraging him to eat healthily and would slip avocado into his eggs. The source, who worked at EPA last year, said Pruitt would often joke about it when he came into the office. Wilcox released a statement from EPA Senior Counsel for Ethics Justina Fugh on Friday, saying she did not “conclude that this is a prohibited gift at all. It was a routine business transaction and permissible even if from a personal friend.” Wilcox did not say when Fugh reviewed the matter or what led her to look into it. Bryson Morgan, who is in private practice and served as Investigative Counsel at the U.S. House of Representatives Office of Congressional Ethics, said he thought it still raised red flags. “I think it certainly creates a perception problem, especially if Mr. Hart was seeking to influence the agency,” Morgan said. Gift rules prohibit executive branch employees from accepting items of value, Morgan said in an interview prior to the EPA’s release of the details. In addition to traditional gifts, those rules apply to favorable terms on a lease. “It’s not just if he is paying market rent,” Morgan said. “A short-term lease is expensive. Is he given the ability to end it any day? Is this an arrangement any other person could get on the open market? My assumption would be this situation does not involve the hallmarks of a specific fair market transaction,” he said in an interview conducted before the checks were revealed. The new disclosure comes as Democrats in Congress are demanding that Pruitt disclose to them more details about his 2017 use of the Capitol Hill home. U.S. Rep. Don Beyer, a Virginia Democrat, called on Pruitt to resign over his failure to disclose the rental deal tied to an energy lobbyist. Hart is the chairman of lobbying firm Williams and Jensen that lobbies on EPA policies like the Clean Air Act, according to its website. The firm also lobbied on issues related to the export of liquefied natural gas and represented Cheniere Energy Inc., which owned the only active Liquid Natural Gas export plant in the United States at the time. Pruitt traveled to Morocco last December and the EPA said in a press release that liquid natural gas exports were a topic of discussion during that trip. Last year, Cheniere Energy Inc. reported paying Hart’s firm $80,000. Hart’s firm specifically lobbied on “issues related to the export of liquefied natural gas (LNG), approval of LNG exports and export facilities.” The firm also lists on its website that it lobbies on other EPA policies like the Clean Air Act. The EPA did not respond to ABC News' questions about whether Hart's lobbying firm had any involvement in arranging meetings during Pruitt's trip to Morocco. Cheniere Energy spokeswoman Rachel Carmichel told ABC News the company ended its relationship with Hart’s firm in December 2017. The spokeswoman went on to say Cheniere was unaware of the relationship between Pruitt and the lobbyist and had not used Hart’s firm to have conversations with the EPA. Norfolk Southern also declined to comment when reached by ABC News. “Since Administrator Pruitt is already involved in allegations of accepting gifts of travel, the question arises whether a sense of entitlement may have led him to violate the gift rules on this rental arrangement as well,” Holman wrote. The head of the nonprofit watchdog group the Environmental Integrity Project and former EPA Director of Civil Enforcement Eric Shaffer called on the EPA's inspector general and Congress to look into the issue. “Does this explain why Pruitt flew to Morocco to pitch natural gas exports, which isn’t really an EPA concern?” Schaeffer wrote in a statement. The EPA inspector general's office is aware of the report, according to spokesman Jeff Lagda. The agency's inspector general is already looking into the cost of Pruitt's travel and whether the agency followed all proper procedures.